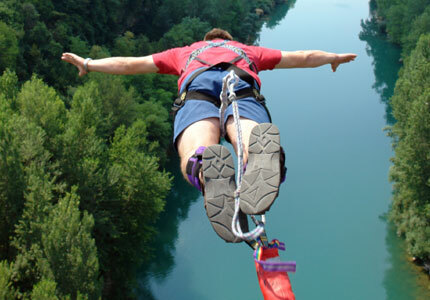 What: We run bungee jumping & rope swing adventures in Northern California. Objects: We jump off bridges, trees, dams & rocks in remote and beautiful mountainous areas. Where: In the Sierra Nevada Mountains of northern California between San Francisco, Sacramento, Lake Tahoe and Yosemite National Park. See Map. When: We typically bungee jump every Saturday afternoon (year round). For more details see our Schedule. More Information: see our FAQ page. Or Contact us (call, text or email). Ready to jump? go to our Sign-up page.